There was a scene in the 1939 film "The Wizard of Oz" when, as Dorothy cowers and quakes before the visage of the great and powerful Oz, her little dog Toto escapes. He runs to a curtain and pulls it back, exposing a little man pulling levers and speaking into a device that disguises and amplifies his voice. After Toto unmasks him, Dorothy and her pals realize exactly who runs Oz and just how much, or how little, he can do to help them … or not. Senate Bill 52 already has a name - the Disclose Act - but we prefer to think of it as Toto's law. It begins to pull aside the curtain, exposing those who would tell us what to do or what to think when it comes to ballot propositions. The Disclose Act would require the top two or three funders of any organization - even those with lifespan of a single election cycle - to be identified on any advertisement, printed or broadcast. While anyone interested in good government, or just making good decisions, is very likely to vote for this law, there are many against it. That's because the people behind the curtains - those who would tell us what to do through sometimes truthful but more often misleading political advertisements - don't want us to know who they are. They want to operate in the shadows or out of sight altogether. Who are these people behind the curtains? Giant corporations, mainly, but wealthy individuals, too. Also big unions, including the California Teachers Association and SEIU. Strange bedfellows perhaps, but clearly aligned when it comes to being able to keep their identities - and agendas - secret. • In TV ads, list the names of the top three funders, in type large enough to read and for no less than 5 seconds. • On radio ads and phone calls, the top two funders would be announced. • Print ads and mailers would have to carry the top three funders. 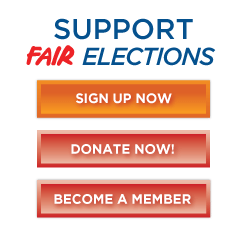 • Any campaign committee that spends more than $1 million will have to develop a website linked from the Fair Political Practices Committee website, with links visible on all ads. These rules would in no way hinder anyone's ability to speak forcefully, loudly and frequently in favor of ballot measures; it would, however, ensure that we know who is doing the talking. In the age of Supreme Court decisions that grant corporations the free speech rights of citizens and allows them to spend as much money as they want to influence voters, we think this law is essential. The bill should be a no-brainer, a slam-dunk, a chip shot. It should be passed on a voice vote. Instead, it's likely to go down to defeat unless regular citizens let legislators know we want - and need - this law. Use iGive and 1,800+ stores donate to us when you shop! 3916 Sepulveda Blvd, Suite 208, Culver City, CA 90230. United States.